Drinking water utilities currently rely on a range of microbiological detection techniques to evaluate the quality of their drinking water (DW). However, microbiota profiling using culture-free 16S rRNA gene next-generation sequencing (NGS) provides an opportunity for improved monitoring of the microbial ecology and quality of DW. Here, we evaluated the utility of a previously validated microbiota profiling platform (MYcrobiota) to investigate the microbial dynamics of a full-scale, non-chlorinated DW distribution system (DWDS). In contrast to conventional methods, we observed spatial and temporal bacterial genus changes (expressed as operational taxonomic units - OTUs) within the DWDS. Further, a small subset of bacterial OTUs dominated with abundances that shifted across the length of the DWDS, and were particularly affected by a post-disinfection step. We also found seasonal variation in OTUs within the DWDS and that many OTUs could not be identified, even though MYcrobiota is specifically designed to reduce potential PCR sequencing artefacts. This suggests that our current knowledge about the microbial ecology of DW communities is limited. 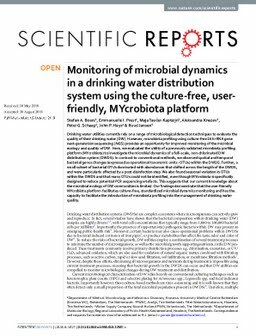 Our findings demonstrate that the user-friendly MYcrobiota platform facilitates culture-free, standardized microbial dynamics monitoring and has the capacity to facilitate the introduction of microbiota profiling into the management of drinking water quality.